The finale of this year's Royal Edinburgh Military Tattoo will mark the last performance of one of its stars. 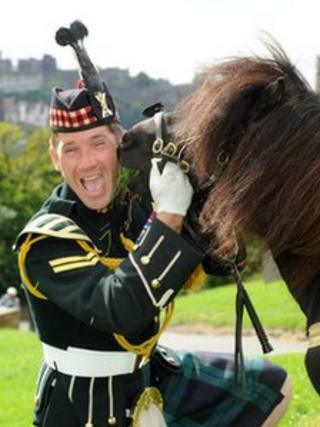 Shetland pony mascot Cruachan III has led the Royal Regiment of Scotland at the Tattoo for the past three years. The 23-year-old, who is about 90cm tall, is retiring after a total of 19 years of military service. He will now have more to spend in his field at Redford barracks, with long-term companion Islay, also a Shetland pony. Cpl William Perrie looks after Cruachan III on duty. He said the pony steals the show at the Tattoo most nights. He added: "Everyone just loves him. Basically he was the centre of attention every night. "But he is 23 now, so 25 nights in a row is a bit much. It's time to retire to his field where he can go at his own pace. The 63rd Tattoo has been a sell-out for the 14th consecutive year, generating £8.4m at the box office. This year's show has a Diamond Jubilee theme, with more than 1,000 pipers, drummers and other musicians performing on the esplanade of Edinburgh Castle to celebrate 60 years of the Queen's reign. Military bands from countries around the world including Australia, Switzerland, Norway, Canada and the US have been performing during its three-week run.